Dental fear and phobia can range from mild anxiety (which many people experience) through to a full-blown phobia where even the mention of visiting a dentist can create a reaction. The trigger for this fear can be widespread, often stemming from childhood or early years and previous experience at the dentist, for some it may be the smell, others the drill, others the needle, some people find a perceived loss of control difficult and for some just the thought of someone touching inside of their mouth is enough to trigger the anxiety. 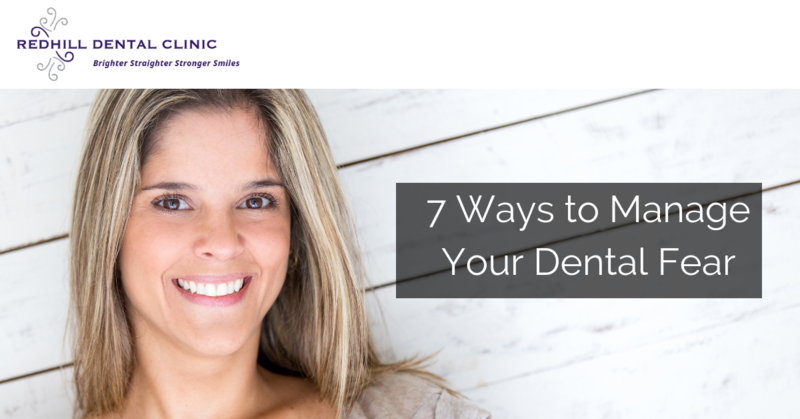 The first thing we need to say is that dentists are trained to help patients overcome their fears, dentists want to help you maintain a healthy mouth, keep your teeth for life and it is for this reason that we’ve written our 7 top ways to manage your fear. This is a very simple yet very effective technique, it will ensure you can relax for the rest of the day as your appointment will be over. It also didn’t give you time to build up the dental anxiety throughout the day I will help you feel less anxious. 2. Make sure you have a good breakfast. This is only for regular appointments, but a good and healthy breakfast will set you up for the day and ensure that your energy levels remain high. With good quality nutrients in your body your resources remain higher you will be better able to cope with your dental visit. Alcohol may seem to improve your mood in the short-term but in the longer term it increases symptoms of depression and anxiety. Alcohol dehydrates you. This can leave you more prone to blackouts and anxiety leading to more of a bad experience at the dentist. Visiting the dentist after taking alcohol means you will be less able to communicate with your dentist and less able to take advantage of any other relaxation techniques. Bringing a friend to your dental treatment can really help, it’s often mentioned that people feel uncomfortable or nervous in the waiting room, bringing a friend with you and deciding beforehand what you will talk about means you are far more likely to be able to relax with your friend taking your mind off things. If you are clear about why you are avoiding the dentist it can really help, is it a fear of pain? Is it fear of the dental procedures? Is it the needle? You may find it easier to write these things down and bring them with you, you can then hand this list to your dentist, letting them know you are an anxious patient. Your dentist will then have a clear list of things to either avoid or help you overcome. 6. Talk openly to your dentist. Dental phobia will always be exacerbated with little or no communication. Be honest with us, we will not judge you take you off for not coming in to see us. Your dentist is here to prevent tooth decay and gum disease and look after your dental care. We absolutely understand that the world is full of nervous patients and we’re here to help. 7. Agree a stop signal. Agreeing a stop signal can really help, it can be simply raising your hand. Let the dentist know that if you raise your hand you would like them immediately to stop and give you a breather. You could even agree that, if it’s convenient, you could be sat up if you raise your hand. Just sitting up for a minute, taking slow breath can really help you to relax. There are a variety of medical ways to help with dental phobia as well, gas and air is a common option however we prefer to use oral conscious sedation at our practice in Stourbridge. We have found that this simple to take a pill which is taken about half an hour before your appointment can really help you relax. If you decide on this option you would need to ensure that you have a travel companion with you and that you don’t drive after taking the tablets for a few hours.